NEW YORK CITY: Gay "Mike Hot-Pence" Lookalike Raises Money For Charities In Times Square [VIDEO] - Joe.My.God. In a sobering post-election period, Glen Pannell has figured out a way to make us smile — one pants-less donation at a time. The graphic designer and actor bears more than a passing resemblance to Vice President-elect Mike Pence, and now he is using that genetic stroke of luck to help others as a part of a tongue-in-cheek impersonation that also raises money for causes close to his heart. 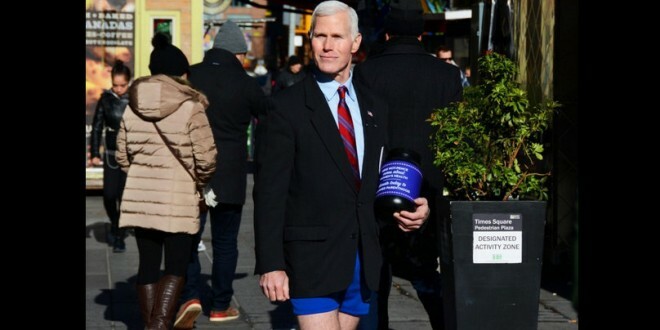 Anchoring himself in the tourist mecca known as Times Square last Saturday, the 51-year-old New Yorker transformed into Mike Hot-Pence as he donned a conservative-looking suit jacket and tie from the waist up, and just a vintage pair of short-shorts down below as he held a jar seeking donations for Planned Parenthood.